Following in the steps of the Shijian-8 mission in 2006, China has successfully completed the Shijian-10 recoverable satellite mission. 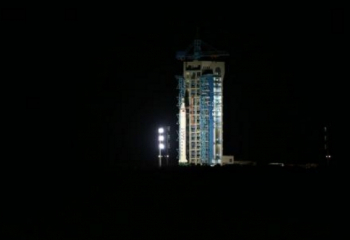 The launch of Shijian-10 took place at 17:38 UTC on April 5, using a Long March-2D launch vehicle from the 603 Launch Pad at the Jiuquan Satellite Launch Center’s LC43. 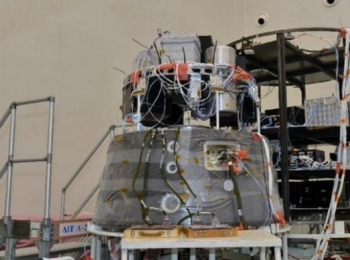 The capsule safely returned to Earth on Monday morning. Microgravity experiments on Shijian-10, the 24th recoverable satellite of China, covered the fields of physical science and life science. The scientific purpose of the program is to promote the scientific research in the space microgravity environment by operating Shijian-10 at low Earth orbit for two weeks. There were six experiments for fluid physics, three for combustion and eight for materials science in the field of physical science. Also on board were three experiments for radiation biology, three for gravitational biology and four for biotechnology in the field of life science. The experiments were selected from more than 200 applications. The satellite also carried an experiment from the European Space Agency that consisted of containers of highly pressurized crude oil will to help to improve our knowledge of oil reservoirs buried kilometers underground. Shijian-10 operated on a 220 x 482 km orbit at 63 degrees orbital inclination for two weeks. The launch mass of the satellite was 3,600 kg. Space microgravity experiments in China have been completed mainly on board recoverable satellites since the 1980s (FSW program) and on board the Shenzhou manned and unmanned missions. The launch of Shijian-8 on September 9, 2006, was a turning point for this kind of mission. 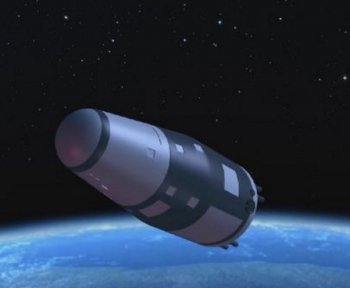 The program for Shijian-10 was organized by Chinese National Space Administration (CNSA). Ten experiments for microgravity physics and 10 experiments for space life science were selected from more than 200 applications for the mission in the late 2004 and early 2005. The space experiments (including two in collaboration with French Space Agency and one with Europe Space Agency) were reviewed in October 2005, and the engineering proposal of satellite platform was reviewed in May 2006 by CNSA. After this phase, the demonstration working group on “recoverable satellite of scientific experiments for space environment utilization” was formally organized, and the mission was named as Shijian-10. Unfortunately, the demonstrative phase was stopped after one year due to the reform of CNSA and re-started when the government of China determined to move the national management of scientific satellites from CNSA to Chinese Academy of Sciences (CAS) in 2011. The demonstration phase was then restarted and completed at the end of 2012. After that, the engineering phase of the program was started at the beginning of 2013. CNSA organized an expert group for microgravity research, divided into seven sub-categories: microgravity fluid physics, microgravity combustion, space material sciences, space fundamental physics, radiation biology, gravitational biology and space biotechnology. The microgravity research and the selection of space experiments in the programs of recoverable satellites missions were arranged in the seven fields of research: Fluid physics, combustion, material science, radiation biology, gravitational biology and biotechnology. The scientific purposes of the experiments are to promote the basic research of fluid physics and biology experiments; to support the manned space flight for fire safety research; to improve the human health by biotechnology studies; and to develop high-technology by experiments of coal combustion, material materials processing and biotechnology. 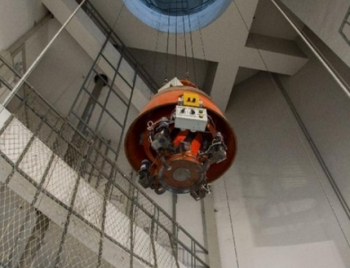 The return of the capsule was confirmed by the Chinese State media, with further information noting separation of the capsule from the orbital module occurred at 08:15 UTC on Monday. The orbital module will continue to function for at least three days to conduct fluid physics experiments on board. 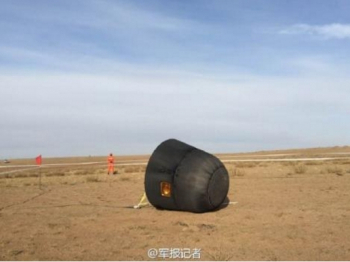 The capsule was then confirmed to be on the ground at its landing site in Inner Mongolia. Recovery crews were soon on the scene, allowing for its safing processing to take place. It will then be transported back to China. 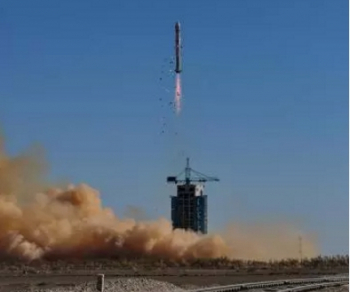 The mission began just two weeks ago, when via the launch of the Chang Zheng-2D rocket. This launch vehicle is a two-stage rocket developed by the Shanghai Academy of Spaceflight Technology. With storable propellants is mainly used to launch a variety of low earth orbit satellites. The development of CZ-2D was started in February 1990. From 2002, to meet the demand of SSO satellites, the payload fairing of 3.35 meters in diameter and attitude control engine for the second stage have been successfully developed; and the discharge of remaining propellant and de-orbit of the second stage have been realized. This launcher is mainly used for launching LEO and SSO satellites. It is characterized by high reliability, wide application and mature technology. The CZ-2D can launch a 1,300 kg cargo in a 645 km SSO. The rocket is 41.056 meters long and the first, second stages and payload fairing are all 3.35 meter in diameter.